Resonance Raman (RR) spectroscopy is a powerful approach for obtaining information about the vibronic structure, and thereby the geometry changes that occur upon electronic excitation, for large molecules whose absorption and fluorescence spectra are diffuse. The intensity of each peak in the RR spectrum reveals the projection of the ground– to excited-state geometry change onto a specific normal mode. This allows determination of the atomic motions that occur upon excitation of molecules that do interesting photochemistry or photophysics. Resonance hyper-Raman (RHR), the two-photon-excited analog of RR, provides additional information about excited states that are both one– and two-photon allowed. Two-photon transitions are important in a variety of applications including electro-optic modulation for fiber-optic telecommunications, two-photon fluorescence microscopy, and high-resolution microfabrication techniques. Hyper-Raman scattering is a very weak process in most molecules and until recently it had rarely been used for molecules in dilute solution. However, we recently demonstrated that RHR can be reasonably strong from conjugated “push-pull” molecules that have both large dipole moments and large polarizabilities. Comparison of the RR and RHR spectra reveals the presence of multiple electronic transitions within a single absorption band and simultaneous modeling of the linear absorption, RR, and RHR spectra can provide a detailed description of these transitions. Our current areas of research in RHR include the effect of intermediate one-photon resonances on hyper-Raman scattering, the solvent dependence of RHR spectra and intensities as a probe of solvent effects on two-photon transitions, and hyper-Raman and hyper-Rayleigh scattering as a probe of solvent-induced symmetry breaking in nominally centrosymmetric molecules in solution. Lian C. T. Shoute, Glenn P. Bartholomew, Guillermo C. Bazan, and Anne Myers Kelley. Resonance hyper-Raman excitation profiles of a donor-acceptor substituted distyrylbenzene: one-photon and two-photon states. J. Chem. Phys. 122, 184508 (2005). Anne Myers Kelley, Lian C. T. Shoute, Mireille Blanchard-Desce, Glenn P. Bartholomew, and Guillermo C. Bazan. Resonance Raman, hyper-Raman, and hyper-Rayleigh depolarization ratios and symmetry breaking in solution. Mol. Phys. 104, 1239-1247 (2006). Lian C. T. Shoute, Mireille Blanchard-Desce, and Anne Myers Kelley. 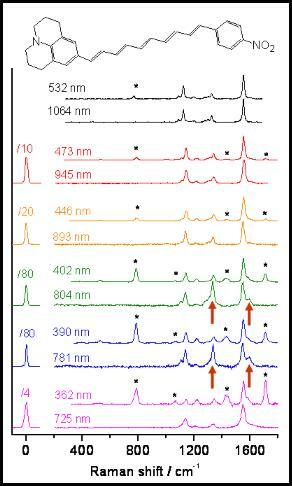 Resonance hyper-Raman excitation profiles and two-photon states of a donor-acceptor substituted polyene. J. Phys. Chem. A 109, 10503-10511 (2005). Lian C. T. Shoute, Robin Helburn, and Anne Myers Kelley. Solvent effects on the resonance Raman and hyper-Raman spectra and first hyperpolarizability of N,N-dipropyl-p-nitroaniline. J. Phys. Chem. A 111, 1251-1258 (2007). Weinan Leng and Anne Myers Kelley. Hyper-Rayleigh and hyper-Raman scattering with intermediate and two-photon resonances. J. Chem. Phys. 127, 164509 (2007). Weinan Leng and Anne Myers Kelley. Resonance hyper-Raman spectra of zinc phthalocyanine. J. Phys. Chem. A 112, 5925-5929 (2008). Anne Myers Kelley. Resonance Raman and resonance hyper-Raman intensities: Structure and dynamics of molecular excited states in solution. J. Phys. Chem. A 112, 11975-11991 (2008) (invited Centennial edition). Weinan Leng, Guillermo C. Bazan, and Anne Myers Kelley. Solvent effects on resonance Raman and hyper-Raman scattering for a centrosymmetric distyrylbenzene and relationship to two-photon absorption. J. Chem. Phys. 130, 044501 (2009). Anne Myers Kelley. Hyper-Raman scattering by molecular vibrations. Ann. Rev. Phys. Chem. 61, 41-61 (2010).